The earliest carded ESB action figures to be released actually featured a revised version of the previous SW version of the card back, which advertised 21 individual action figures. Only the first 21 figures previously released on SW cards were issued on these transitional ESB cards, and these were soon re-issued on the subsequent incarnation of the ESB blister card, the 31-back. The ESB 21-backs are thus fairly scarce and highly sought after by many carded figure collectors. 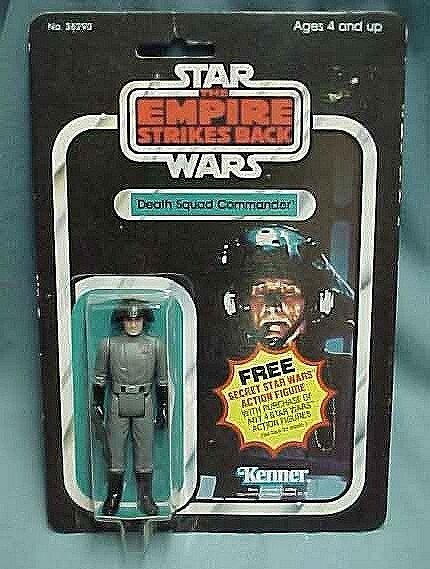 Here you see perhaps the most desireable of these packaging variants, the ESB "Death Squad Commander." What makes this piece particularly interesting is that the name of the figure was changed on all later cards to the somewhat tamer "Star Destroyer Commander." Very few of these figures seem to have been issued, and today it stands as one of the rarest existing packaging variations. Here you see the back of the ESB 21-back. 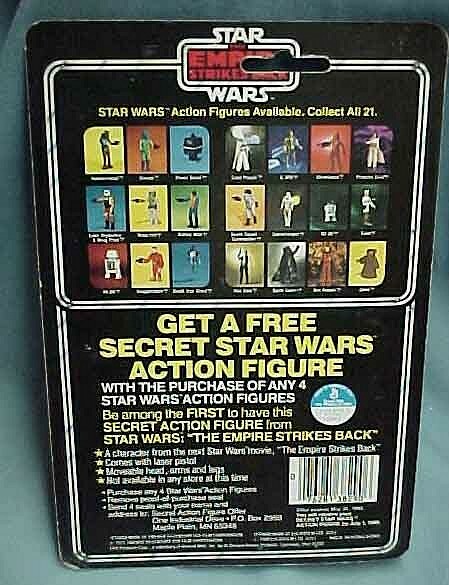 It advertises the "Get a Free Secret Star Wars Action Figure" offer, which is also mentioned on the card front, and which eventually turned out to be Bossk. These images were graciously provided by Final Frontier Toys. They carry a wide variety of Star Wars merchandise and can be reached by phone at 209-257-0345.